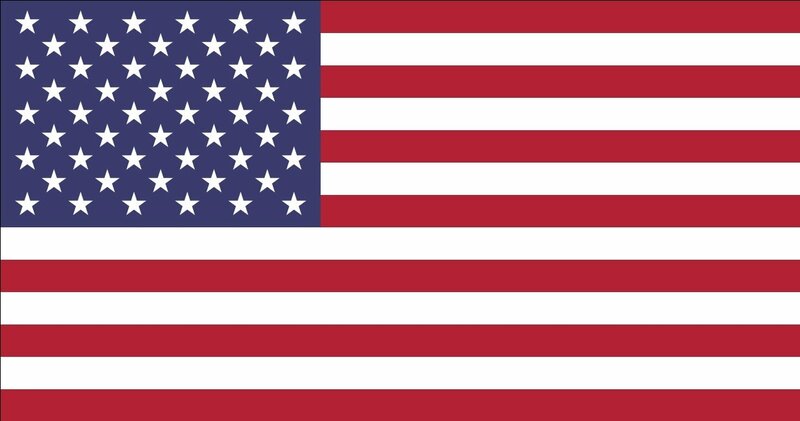 According to Nielsen Music’s new mid-year report on the US market, there were 403.4bn total music streams in the States in the six months to end of June, up 41.6%. Of that number, 268.2bn streams were on audio platforms (+45.4%) and 135.2bn were on video platforms (+34.7%). MBW has dug back through recent history to see how that compares to previous years in real numerical terms. The results look very positive for an industry whose recent watchwords, when it comes to projected US streaming growth, have included ‘fragile’, ‘cautious’ and ‘conservative’. 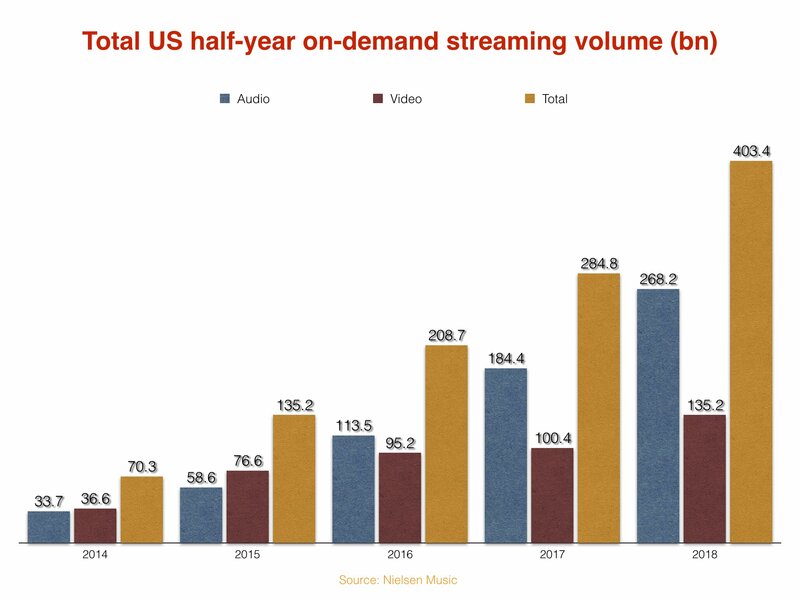 The total jump in US-based, on-demand music stream volume from H1 2017 to H1 2018 was 118.6bn plays (ie. 284.8bn to 403.4bn, see below). That’s more than the H1 annual volume growth seen in 2017, 2016 or any prior year. 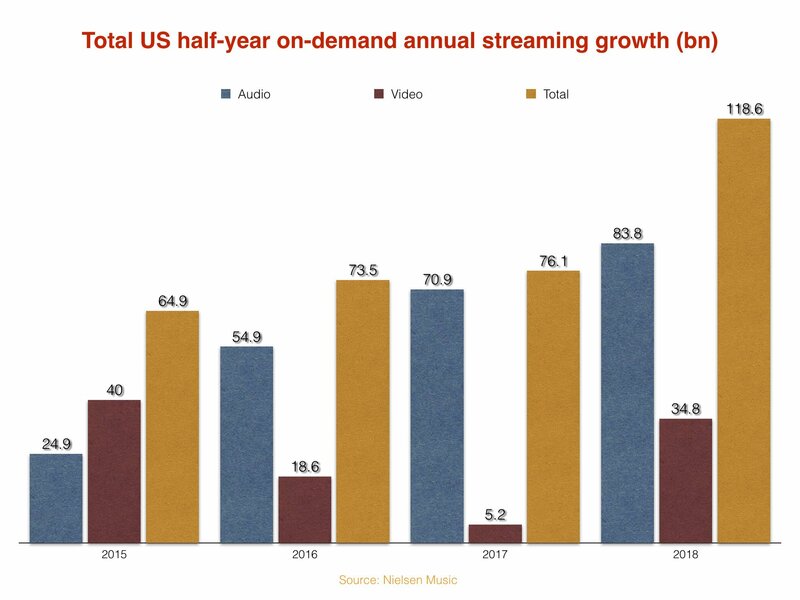 Similarly, the annual mid-year growth in total US audio music streams in H1 2018 stood at 83.8bn (ie. from 184.4bn to 268.2bn) – again, the biggest jump in history. The increase in six-month video music streaming volume, however, at 34.8bn, was smaller than that seen in 2015, when the year-on-year jump stood at 40bn. 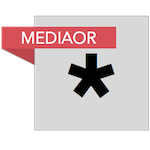 One word of clarification: Nielsen Music doesn’t differentiate between paid and ad-funded streams here, so making a prediction of how this will ultimately impact on industry revenue figures is difficult. But the overall signs are definitely positive. When it came to good, old-fashioned sales in H1 2018, the numbers were – predictably – less kind. Physical album sales in the States fell 14.6% year-on-year to 41.3m, although within this vinyl LP sales grew again – up 19.2% to 7.6m. Meanwhile, digital track sales continued to plummet, down 27.4% on H1 2017 to 223.1m. 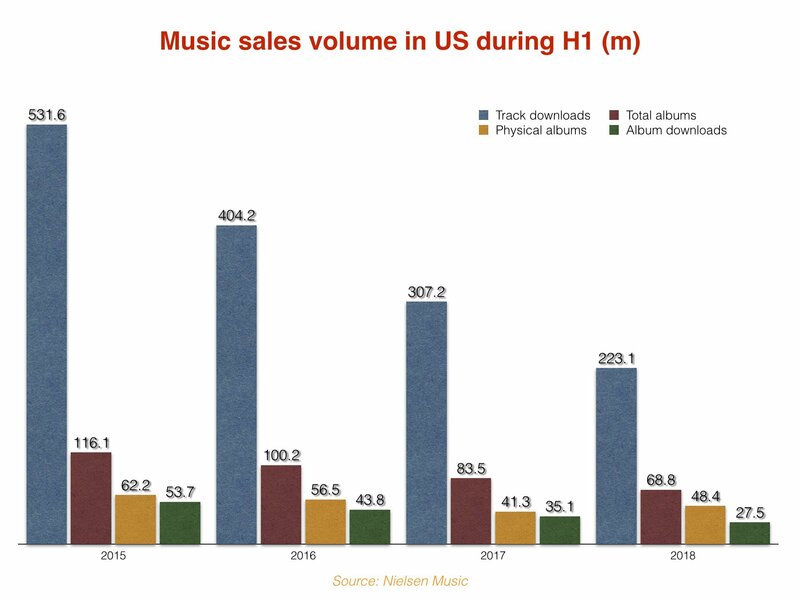 Digital album sales volume fell 21.7% year-on-year in H1 2018, down to 27.5m. Across all formats, using Nielsen/Billboard’s ‘equivalent consumption’ metrics, Post Malone (pictured, main) was judged the US’s biggest artist of the first six months of 2018. The act racked up 2.625m ‘total album equivalent consumption’ in the period, with 324,000 pure album sales, 2.03m track downloads and 3.146bn on-demand audio streams. In terms of pure audio streams, however, Drake was the king of the USA. 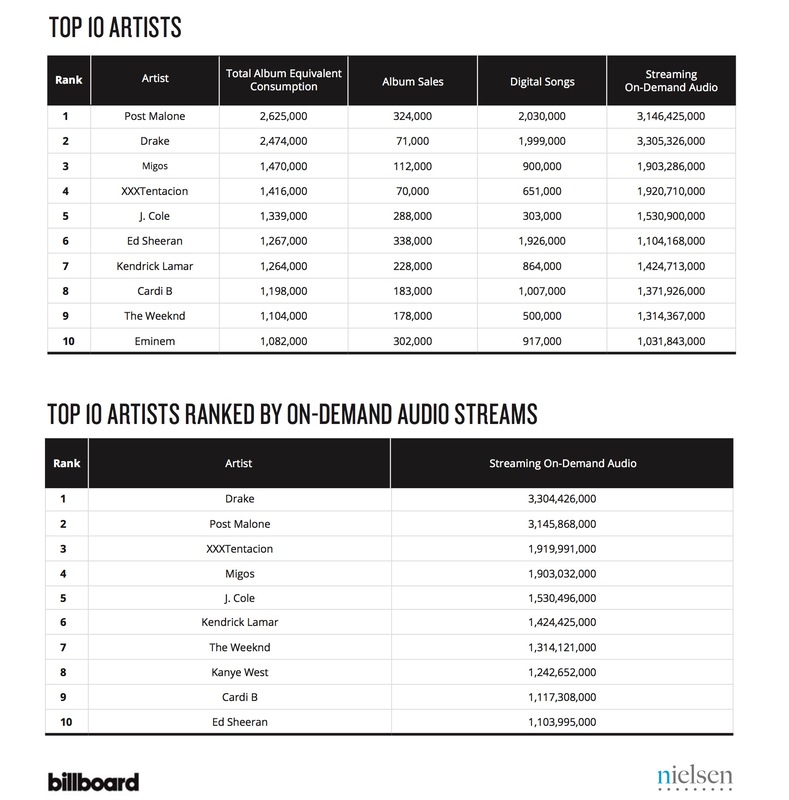 The Canadian megastar, whose Scorpion shattered day-one streaming records on its release date (June 29), recorded 3.304bn on-demand audio streams in H1 2018 in the States.